I've been following World Cup, as nothing better to do. In this cup, New Zealand has been also playing. 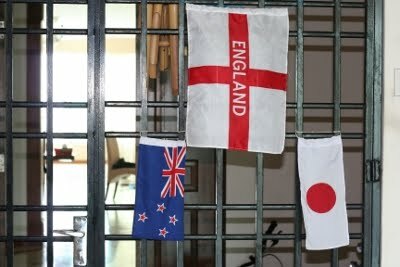 Our family have 3 countries to support. Very busy everyday and so fun. Unfortunately New Zealand couldn't make through to the round of 16, but they played well considering the fact they have a couple of non-professional players. I sometimes think, "This player looks like Jason" when I watch Danish games. Jason's mother side has some connection to Denmark and Jason is a quarter Danish. I'm often made realised Jason has strong Danish features in his looks. I from time to time feel like supporting Denmark as well, but for Jason, this doesn't particularly give him any feelings, I think.